•	First time visitors to the Burt’s Bees Baby website are going to be able to take advantage of a limited time only offer. Sign up for the free email newsletter this company publishes every week and you’ll get a 10% off coupon to be used on your first order right away. •	All orders of $100 or more that are placed on the website from US based customers are going to get free shipping included. Express and international shipping options are available, too. 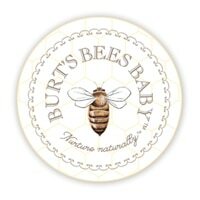 •	Customers that sign up for the Burt’s Bees Baby registry will get coupon codes to use across the site, and all items that are added to their registry will also be discounted as well. Burt's Bees is a company that has been known for their natural products for adults, though they have recently expanded their product inventory and now have a dedicated website for baby products called Burt's Bees Baby. On this website you can take a look at different bath and bedding items along with storage and gear. If you have a friend or a family member that is expecting a baby, you can browse through the “Gifts” page to find items that you can buy. Also, if you're expecting you can sign up for a baby registry on their website. There may be ways for you to save when you take a look at the “Sale” page. For most up to date offers check out Burt’s Bees Baby on Facebook and Twitter or contact Burt’s Bees Baby Support for any questions.